I’ve been saving this post for a little while now. I wanted to wait for a good special occasion to start back up with our interesting inerview and now is the time. Here we are mid March, the month of our five year anniversary, I wanted to bring back one of my favorite parts of Nardio, our Interesting Interviews. I love these so much. I love giving insanely talented people a list of questions and then finding myself totally enamored with the responses. I love that we don’t just interview any and everybody but instead focus on people we respect. Creators whose work have wowed and moved us. For this interesting Interview I choose a good friend of mine and a game developer that I really respect, Jordan Pearson. 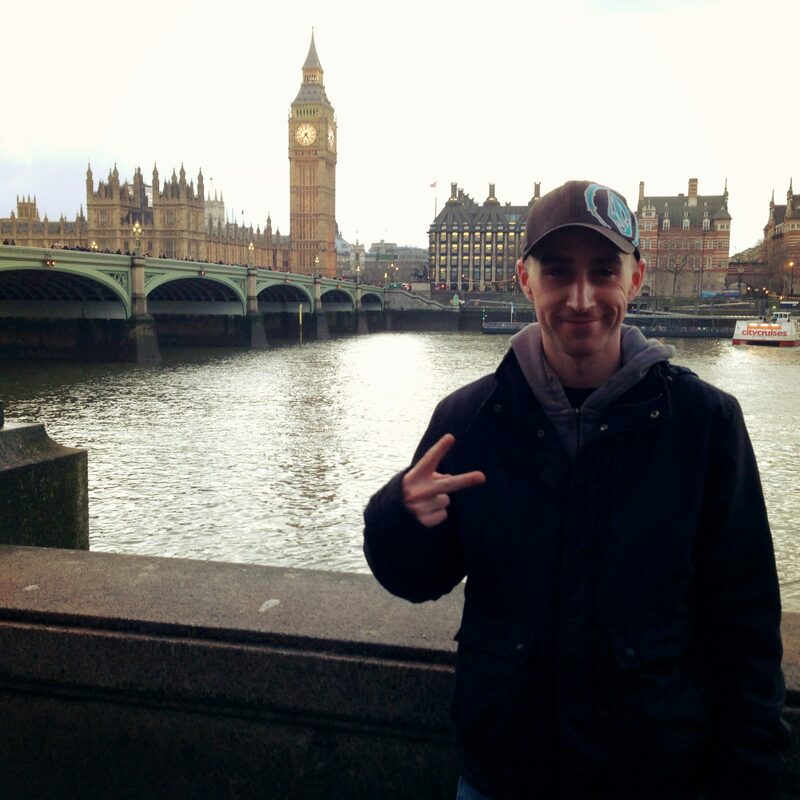 Jordan Created the Cally’s Caves series along with his development company VDO games. We met through twitter when he randomly gave me encouragment to keep up with my game development that I had been doing as a side hobby. I found out he created a game that I owned and didn’t try yet. Soon after I did. It was Cally’s Caves 2 and I loved it. I found that he made it in GameMaker, the same game development tool that I was struggling so hard with. It gave me hope to keep going and even better still I made a pen pal. I would later one beta test Cally’s Caves 3 for both iOS and again on PC for it’s eventual and glorious Steam release. So yea, I respect this guy a lot. I really hope you enjoy this interview my friends! I always loved games, they have been a constant for me throughout my life. I kind of fell backwards into making them, because I was in a horrible job and had some bad things happen to me in the years leading up to 2013. I guess you could say I was inspired by the way my life was going. When my friend Dave and I got started, I really wanted to name the company “Purple Future” and he really wanted to name it VDO Games. I ended up not fighting him on the title as a play in another design argument we were having. A “fine I’ll give you the title if you give me this” type situation. Can you tell us about how VDO Games got started? I finally decided to leave the horrible job I mentioned earlier, and while I had a bunch of free time, I started messing around with Gamemaker in June 2013. I had worked with Dave and he was one of my best friends, and I eventually convinced him to come on board the project with a prototype called “Purple Caverns.” I gave him the prototype and pitched him the idea of the Cally Character, and the name “Cally’s Caves,” as well as the bit about her saving her parents. Just go for it. Be reasonable, and don’t quit your day job and bank everything on it. But if you love games and have an awesome idea for a game, you should definitely try your best to make it happen. Any hard lessons learned that you wish to warn new game devs about? The hardest lesson we had to learn was handling rejection without being discouraged. We had to learn to not get down when no one responded to our forum threads, or reviewed our first game. For the first year or two, 100% of everything we did was ignored by everyone, and every attempt we made at promotion got blanked. But if we had led that discourage us from continuing to promote the game, we would have stopped making them after our first one. It’s awesome. A teacher at my nephew’s school is doing a coding club at school based around this iOS app called “Hopscotch,” and it’s really exciting to see. I can’t wait to dive into the app and play some games that my nephew makes. I get more excited about the programs in elementary schools though, because that’s how I got my basis in coding. The college programs seem awesome too, especially if you want to go into AAA game making and stuff. What inspired you while making the Cally’s Caves series? How has your game making evolved throughout the years? New tools, new ways to work, etc. With each game’s release, we have upgraded and revamped the engine, but we are still on the core engine we used on the first game. So our tools for constructing the games haven’t changed too much, but we have moved from Skype to Slack, and now to Discord for team communications. Can you explain the evolving art style of Cally’s Caves? For Cally’s Caves 1, Dave did the art without any prior experience in pixel art, which was a very impressive task. Starting with Cally’s Caves 2, OHKO took over, and he brought his pixel art style to table (In my mind, I think of the art style as “reminiscent a Square RPG”). Since then, I think the art style changes just reflect his continued evolution as an awesome pixel artist. What were some of the most challenging parts of making the various Cally’s games? Getting everything set up to actually build the right type of game file was a tremendous hassle at the time! To publish something on the iOS store, you need a Mac, and I didn’t own one, so I had to walk about a mile each way to my sister’s apartment to make builds, carrying my big PC desktop tower. It was a huge pain, but without my sister’s help there, making the original game wouldn’t have been possible. 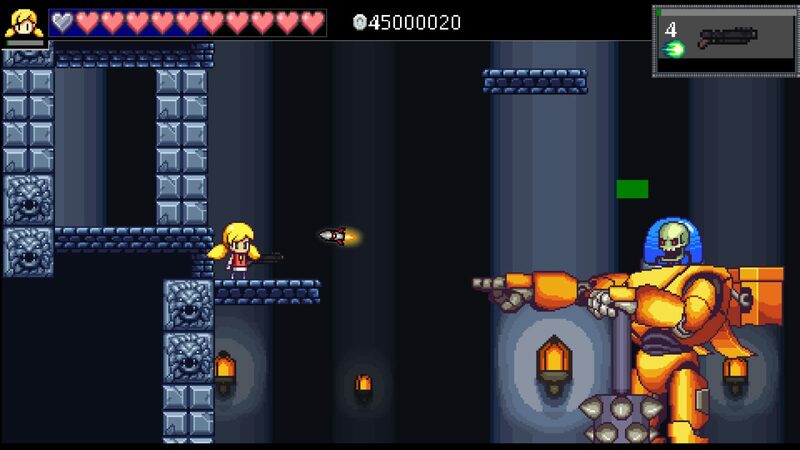 For Cally’s Caves 2, the biggest challenge was bringing more refinement and polish to the game. Cally’s Caves 1 had code that felt very amateurish (because I was, and still am an amateur), and I really had to push myself to learn better methods and make everything feel more like a real game. By the time we got to Cally’s Caves 3, the biggest challenge was the “polish” period itself. This is the time devoted to fixing everything up right before you release the game, and in CC3 it lasted about 4 months. Because the scope of the game was so much bigger, everything was really easy to come up with, but the polish period is where you can’t leave anything to the future. Any idea, or system you had in mind, you have to create with keystrokes, and there are no excuses. You either make it happen, or you have to cut it, and in CC3, that was probably the most challenging time. I always get a dumb grin on cause it’s fun! How do you deal with negative and harsh reviews? I usually try and take something away from it, like an area I can work on to make the next game better. They don’t bother me because I went through a long time of getting no reviews. So getting a really crappy review that just tears the game up still feels like a good thing, because I remember that. I think they are the best, and that anyone getting into indie development should prioritize these two platforms specifically. I’m also very biased because, since about 2009, they have been my main gaming platforms. 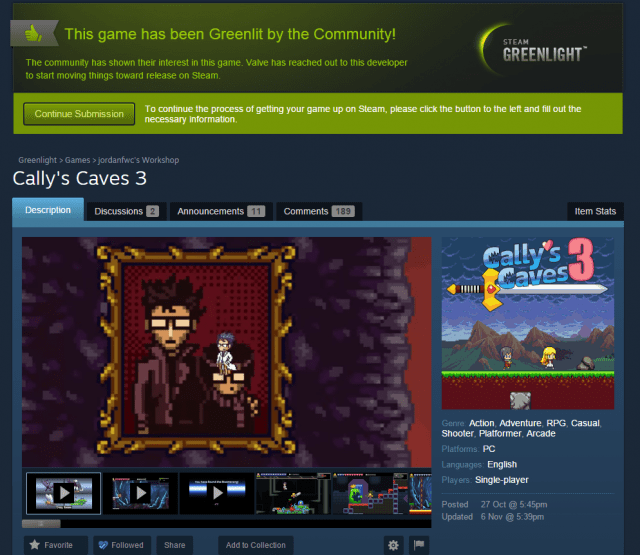 Cally’s Caves 3 was Greenlit on Steam pretty quickly. What do you attribute that to? Can you explain what the process was like for you? How did it feel when you realized your game had been Greenlit? It’s tough to say why it was Greenlit so quickly, and I definitely spent a TON of time analyzing everything about it. I think the main reason we were able to keep traffic up for the 10-day campaign was because we went in with a plan. We had two weeks worth of blog posts and videos set up before we even launched the Greenlight. So we had new content on the Greenlight page every single day of the campaign, and I was already working on more when the game got Greenlit. I feel like that’s probably why, but then if you look through GL, you can see other games that had no updates after the initial posting getting greenlit super fast, and others that have tons of posts taking months to get through. So it’s tough to draw strong conclusions. I don’t think it’s something that one can say “it’s good” or “it’s bad,” because there are so many variations on the formula. Personally, I’m the type of gamer, that I made it super far in Candy Crush Saga because I enjoyed how challenging the puzzle aspect of the game got if you never put any money into it. Not too worried, just because we don’t have some crazy unique formula for the game. It’s been interesting to watch. The tablet/phone has completely upended where the money is in game development, and I think we are seeing a lot of the AAA market on console and PC shrink a little bit as a result of that. But it’s also created this time where 2-person teams are making games that can be downloaded with a tap by hundreds of millions of people. It’s amazing. I haven’t gotten one yet, but I would probably get a PS4 so I can play the Ratchet and Clank game that came out for it. This is a cliche answer, but Super Mario Bros for the NES. My Uncle bought an NES in 1988 or something and brought it over to my house and left it there for one day, and it was one of the greatest days of my life. The game that most recently blew my mind was Rocket League. It blew my mind because it is totally one of those arcade sports games from the old days made into something new and amazing. I hope it prompts a resurgence in simpler sports games that aren’t so simmy. If you met someone at a party who knew nothing of gaming what would you recommend they start off with? Mr. Robot. Just finished Season 2. I am also highly anticipating season 3 of the Leftovers. Saga, although I read my last issue like six months ago. A huge, huge thanks to Jordan for taking the time to do this interview. I know he is swamped with making his next masterpiece with Super Cally’s World. You should all do yourselves a favor and follow this man on social media and get his many amazing games. Next story SEUM “Season 3” Update is out now!